Do you want to know the exact physical location of the server hosting specific website or ip address? You may need such information while researching on prospective hosting company’s server location for future use. There are few free online tools that can extract physical geographical location details of the server from website URL (hostname) or IP address information. Using these, you can easily find country, place or region where specific server is located and is hosting specific website or hostname or ip address. 1. 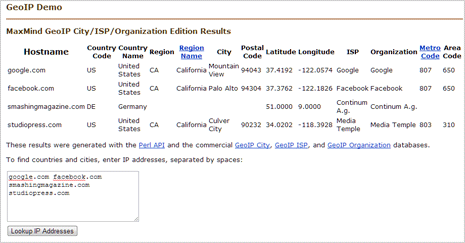 Max Mind Geo IP – It provides free online tool to find physical geographical server location details from website (host) name or IP address. 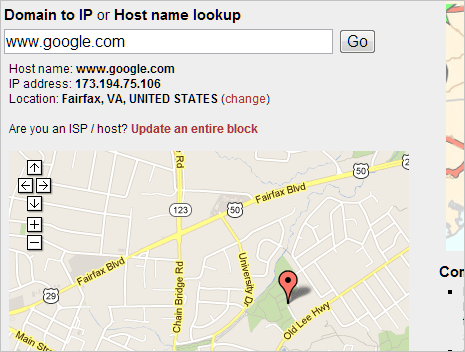 Just type URLs or ip addresses of one or more websites seperated by space and click “Lookup IP addresses” button. Tool will fetch and display detailed physical location information for every hostname or IP addresses you requested for including: country coder, country name, region, region name, city, postal code, latitude, longitude, ISP, organization, metro code and area code. Besides being easy and quick, it display results in neat tabulated format. 2. Hostip.info – Online tool at hostip.info provide more interactive location information by showing exact location on Google Maps. To get started, enter hostname (website URL) or IP address and click on GO button. It will show hostname, ip address and location address in the results. It will also show Google Map pointing to the hostname address location on the map. In some cases, you may be asked to narrow down results by providing city or country information for more precise search of host server locations. How to resolve IP address of a host & vice-versa? both are great tools I looked to many of the website servers. I think server location has an impact on SEO of a website also and also to check the authenticity of the site.